These passages from De Trinitate Book 4: 27, English and Latin, and Book 7:12 English and Latin, make it explicit that there is no way whatsoever that the Son is less than the Father, certainly not in authority, and the passage from Ware below this will say that Augustine teachers that the Father has inherent authority and the Son has inherent submission. The Latin word for authority is potestas. Look out for what Augustine says about this. But if the Son is said to be sent by the Father on this account, that the one is the Father, and the other the Son, this does not in any manner hinder us from believing the Son to be equal, and consubstantial, and co-eternal with the Father, and yet to have been sent as Son by the Father. Not because the one is greater, the other less; but because the one is Father, the other Son; the one begetter, the other begotten; the one, He from whom He is who is sent; the other, He who is from Him who sends. For the Son is from the Father, not the Father from the Son. What wonder, therefore, if He is sent, not because He is unequal with the Father, but because He is a pure emanation (manatio) issuing from the glory of the Almighty God? For there, that which issues, and that from which it issues, is of one and the same substance. For it does not issue as water issues from an aperture of earth or of stone, but as light issues from light. For the words, For she is the brightness of the everlasting light, what else are they than, she is light of everlasting light? For what is the brightness of light, except light itself? And so co-eternal, with the light, from which the light is. But it is preferable to say, the brightness of light, rather than the light of light; lest that which issues should be thought to be darker than that from which it issues. For when one hears of the brightness of light as being light itself, it is more easy to believe that the former shines by means of the latter, than that the latter shines less. But because there was no need of warning men not to think that light to be less, which begot the other (for no heretic ever dared say this, neither is it to be believed that any one will dare to do so), Scripture meets that other thought, whereby that light which issues might seem darker than that from which it issues; and it has removed this surmise by saying, It is the brightness of that light, namely, of eternal light, and so shows it to be equal. For if it were less, then it would be its darkness, not its brightness; but if it were greater, then it could not issue from it, for it could not surpass that from which it is educed. Therefore, because it issues from it, it is not greater than it is; and because it is not its darkness, but its brightness, it is not less than it is: therefore it is equal. Or if we choose to admit the plural number, in order to meet the needs of argument, even putting aside relative terms, that so we may answer in one term when it is asked what three, and say three substancesor three persons; then let no one think of any bulk or interval, or of any distance of howsoever little unlikeness, so that in the Trinity any should be understood to be even a little less than another, in whatsoever way one thing can be less than another: in order that there may be neither a confusion of persons, nor such a distinction as that there should be any inequality. And if this cannot be grasped by the understanding, let it be held by faith, until He shall dawn in the heart who says by the prophet, If you will not believe, surely you shall not understand. So we have evidence that the Son is not unequal in substance or in potestatem, which is the Vulgate translation of the Greek exousia, and therefore means in modern English Bibles, “authority.” We then read that in the Trinity, none is less than the other, “in whatsoever way one thing can be less than another.” It seems clear that the Son is not less in authority than the Father or in any other way. 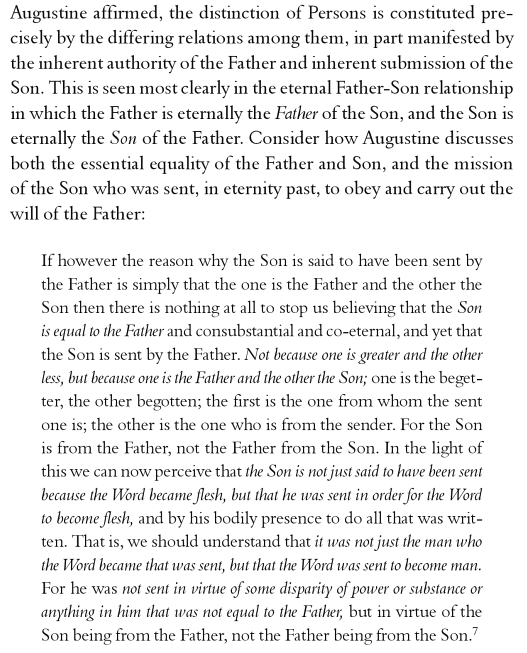 Ware claims that the Father has “inherent authority” and the Son has “inherent submission.” That would make them inherently different, and I don’t think Augustine would support that. I can find nothing in Augustine to support that. Remember that the Son is sent by the Father and the Son together in Augustine. Also in the Trinity, according to Augustine, there is one will and one indivisible working of all three persons. I cannot reconcile Bruce Ware’s writing with Augustine’s De Trinitate in any way, shape or form. What am I missing? Perhaps I am missing the fact that Augustine is irrelevant, but Ware certainly quotes him as an authority. Augustine saw some things differently than the Greek fathers, but this is one thing in which there is consensus among them all. The Cappadocians would be horrified that there might be eternal subordination of the Son, and differentiated the Persons pretty much on the same basis as did Augustine later, although I think without as much detail. Anyway, eternal subordination is a significant departure from classical Christian understanding. Scot McKnight told me that a fellow theology professor told him such a thing is actually considered to be closer to Arianism. If Jesus is not fully God (as well as fully human), then what is he?? ?